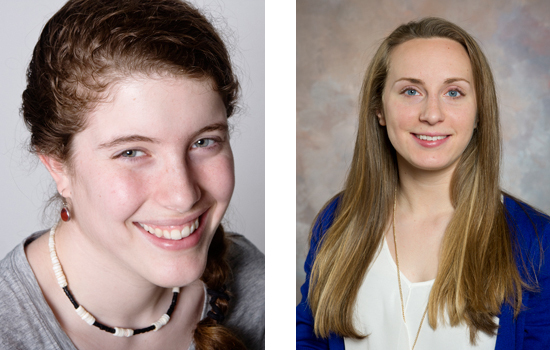 As yet another demonstration of Rochester Institute of Technology’s continuing ascendance when it comes to global learning experiences, an RIT student and alumna have won prestigious Fulbright fellowships for the 2016-17 academic year and 14 others have been awarded international scholarships. All will be recognized this afternoon, when the Office of the Provost hosts its second annual Global Learning Symposium and reception from 3 to 5 p.m. in the atrium of the B. Thomas Golisano College of Computing and Information Sciences. Established in 1946, the Fulbright prize is one of the most prestigious in academic circles and is sponsored by the U.S. Department of State’s Bureau of Educational and Cultural Affairs, promoting cultural exchanges with more than 140 countries. Victoria Scholl, a fourth-year imaging science major from RIT’s College of Science and a motion picture science major from the College of Imaging Arts and Sciences (CIAS). Scholl, a native of Hudson Valley, N.Y., will work in partnership with scientists at the University of Zürich and plans to apply airborne light detection and ranging technology (LiDAR) processing methods to large regions across Switzerland and adapt them for optimal individual tree detection over a 12-month period. LiDAR allows for efficient forest surveying. These findings may then be applied to other forests around the world as a step toward understanding, forecasting and solving global climate change issues. Smalley-Norman is the vice president and 3D modeler at The Hydrous, a nonprofit organization dedicated to modeling coral reefs. Originally from Houston and now a resident of Dover, N.H., Smalley-Norman will produce 3D models and photographs to map coral species in the Philippines. Her work will be used to scientifically identify species and update the CoenoMap, a web-accessible map-oriented database of corals in the Philippines. The models will also be used to calculate coral surface area to better understand growth during climate change. Scholl and Smalley-Norman are among more than 1,900 U.S. citizens who will travel abroad for the 2016-2017 academic year through the Fulbright U.S. student program. It is the flagship international educational exchange program sponsored by the U.S. government and is designed to increase mutual understanding between the people of the United States and other countries. It is the largest exchange program in the country and provides funds for American students to live in another country for one year to teach English, conduct research or earn a graduate degree. Since its establishment in 1946 under legislation introduced by the late U.S. Sen. J. William Fulbright of Arkansas, the Fulbright Program has given approximately 360,000 students, scholars, teachers, artists and scientists the opportunity to study, teach and conduct research, exchange ideas and contribute to finding solutions to shared international concerns. For further information about the Fulbright Program or the U.S. Department of State’s Bureau of Educational and Cultural Affairs, go to http://eca.state.gov/fulbright or contact the Office of Academic Exchange Programs at 202-632-3238 or fulbright@state.gov.